You will have access to an experienced team of professionals to help you find the right property for your strategy. We are your buyer’s agent – but unlike the typical buyer’s agent, you won’t be limited to properties in just a few local suburbs. You can select from a range of different properties all across Australia. Our clients get peace of mind knowing that we have your best interests at heart, and they value the independent advice we give. It’s standard. Honest, customer-focused, long-term service given to you with integrity and ethics is what we are known for. We are an accredited advisor of the ASPIRE Advisor Network. Work with a Simple Property Investment Advisor to create a personalised strategy for your property portfolio based on: your current financial position, goals, preferences, and risk profile. A property investment strategy provides you with peace of mind and a road map to property investment that is tailored to your circumstances. Goals are realistic and planned financial outcomes attainable. Simple Property Investment coordinates with your finance specialist, or can recommend one if needed. It is important to set up the correct finance structure to complement your strategy. This is an important step. Certain strategies require a high degree of specialised knowledge (e.g. the purchase of a property through a Self Managed Super Fund). Not having the proper financial structure in place at the onset of the purchase could negatively impact outcomes. Your Simple Property Investment Advisor will work with you to identify the right kind of properties that suit your strategy and profile. A shortlist will be created of suitable options for you to review from an online portal. Due diligence is also carried out on every property following a strict selection process. A range of selection criteria must be met before a property will be considered an investment option. This is done to give you the best opportunity to reach your property investment goals. 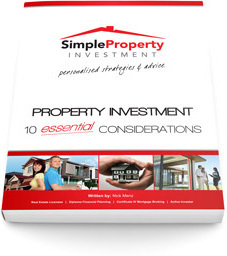 After selecting your property, your Simple Property Investment Advisor will prepare a detailed cash-flow analysis. It will detail all the financial aspects of the investment and how it relates to you and your budget. When the property has been approved for purchase, Simple Property Investment and ASPIRE Advisor Network will manage the transaction process from start to finish. We’ll make your experience as simple and smooth as possible by coordinating all parties involved and facilitating the purchase. You can also log into the property portal to check the progress of your purchase, and access important documentation 24/7. At settlement, you can take advantage of Simple Property Investment’s extensive network: property managers, quantity surveyors, and independent building inspectors to save you time and alleviate stress. Review the process and outcome of your property purchase. We then make plans for the next step of your strategy if required.